So it IS the whale that made her lost her legs. The actress started filming Knight in June 2011, working on and off until the fall in locations including Los Angeles, New York and Pittsburgh. She says there were long gaps when she wasn’t needed: “It was a very, very small role. Otherwise, Cotillard is coy about the picture, whose storyline has fueled pages of Internet speculation. All she’ll confirm is that, contrary to some fans’ belief, she does not play Talia, the vengeful daughter of Liam Neeson‘s character, Ra’s Al Ghul (who also appeared in Batman Begins), and that she takes the role of Miranda Tate, an ecologically minded businesswoman who “is fascinated by Wayne Enterprises. They go through difficulties, and she wants to help provide the world clean energies. She’s a good guy.” But does she stay that way? “Yes,” she insists. That road wasn’t easy. Cotillard had just days to prepare before Rust started shooting in the fall in Antibes, France. “I knew I wouldn’t have a lot of time to rehearse, and it was very disturbing to me because Jacques works a lot with the cast before he starts a movie,” she says. It wasn’t only her fellow actors she had to worry about. 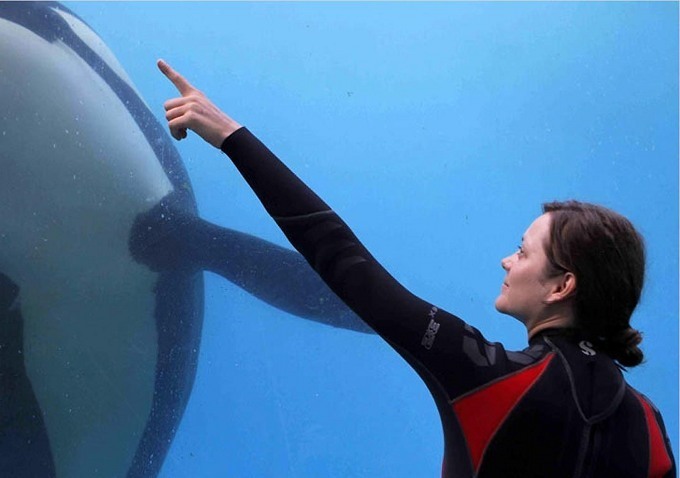 There were killer whales, too.”It was a very weird experience because I came back from the United States and was totally jetlagged,” she remembers. “I arrived directly in Antibes where their Marineland water park is. I’ve always had a repulsion going in a place where animals are in captivity. I had to work through my rejection of this world, which I still feel. But I had a job. And even though the orcas are as big as trucks, they’re animals, and you have a connection with them. She’s been super busy this year, in additiom to The Dark Knight Rises, she’s starring in Jacques Audiard’s “Rust and Bone”, which “follows the relationship between a homeless man (Matthias Schoenaerts) and a trainer of killer whales in a sea park (Cotillard) who loses her legs in a horrific accident”, and James Gray’s “Low Life”, which follows “the journey of a Polish immigrant (Cotillard) who becomes caught between a cabaret owner/pimp (Joaquin Phoenix) and and a magician who wants to save her (Jeremy Renner)”. Wow, playing a Wayne Enterprise board member and possible Bruce Wayne’s love interest seems like a walk in the park compared to these.